It's a budget Smithy. It will be great if you can keep the silvers out of the way. Hopefully not too good. This card is... incredibly weak. As the Fan Card Creation Guide says, the difference between $3 and $4 is negligible, so this card is far too weak to only cost $1 more than Smithy, with both an on-play and an on-gain drawback. Heck, I'd give it +4 Cards instead of 3 and price it the same. It doesn't have an on-gain drawback, it has an on-gain attack. Wouldn't players WANT to gain Silvers onto their deck? It's only an attack if other players are going for Silver Workers. Ignore Awaclus. He thinks he's funny. You may trash a card costing at least $2. If you do, +2 Cards. Otherwise, gain a Silver. Trash a card... from where? Your hand, I assume? I mean topdecking Silvers could totally mess up an engine, Silvers that also make your Silver Workers stink... It's way more of an attack than Embassy ever is at least. Yes, it should say from your hand. Forgot to include that. Also, what happened to the image? ...Yes, it should say from your hand. Forgot to include that. Also, what happened to the card image? Uh... nothing. It's still in my post. just thought It'd be nicer to take less space by not including it in the nested quotes. Couldn't decide between one or the other to submit as they're similar but each have their unique uses. If I'm forced to pick one let me know! Yes, you have to pick one and only one to be your official submission. It's unclear what "if you did" refers to in the first version. "If you did" should only be for trashing two silvers. I'm going to stick with the Refinery anyways as I think that's an interesting opening card. Wondering if it should cost a dollar or two higher though as gaining a silver to hand has a baseline with Trading Post (which costs $5). That said, you can only do this three times and afterwards it only turns into a terminal sifter. There's no image on my screen when I look at your post. Hum, okay, those are points I can get behind. I think the solution should be to either make gaining optional (make sure it's never an attack) or make sure it always feels like an attack, by changing it slightly. This way it's a weird in-between thing. It was definitely meant to be more of an attack. If your opponent is using silver worker for draw, obviously having silver hurts. If they aren't, then your silver workers are likely to just be $3 Smithies. I don't hate the idea of this drawing 4 cards either. But I'd rather make a card that is on the weakish side which makes you find smart times to use it than a card that is usually very strong. Decided to push my submission a bit in power to make it a 5$. Still not terribly exciting, and possibly favors Big Money too much. I'll be judging sometime in the next 12 hours. Hopefully that's enough time for those who wish to submit or tweak your entries. If it's your Action phase, +1 Card, +1 Action and + $1. When you play this, it's worth $1 per Silver you have in play. A building society is, I suppose, a small Bank. It's an experiment with the idea of having an Action-Treasure, something I don't think I've seen before. 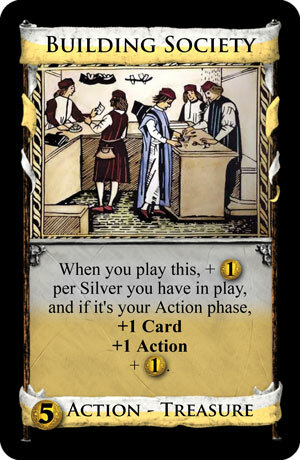 Here, you can either play it as cantrip money or wait to the end of your turn to get more out of it, provided you can get enough Silvers into your hand some other way. According to this current wording, it's worth $1 per silver regardless of if you play it in your action phase or not. That shouldn't matter too much except in the case of Black Market and Storyteller. Is that intentional? It's an experiment with the idea of having an Action-Treasure, something I don't think I've seen before. EDIT: Ah, I forgot about Crown. I suppose the difference is that it does very different things depending on the phase. I'm still up for seeing more of that type of card though! I suggest to make this say "+1$ per Silver in play" first, and then have the Action part. "Worth" sounds like it was something different, perhaps even ineffective if played as an Action, but several cards imply the words actually mean the same. Here's my submission, the Silver Miner. 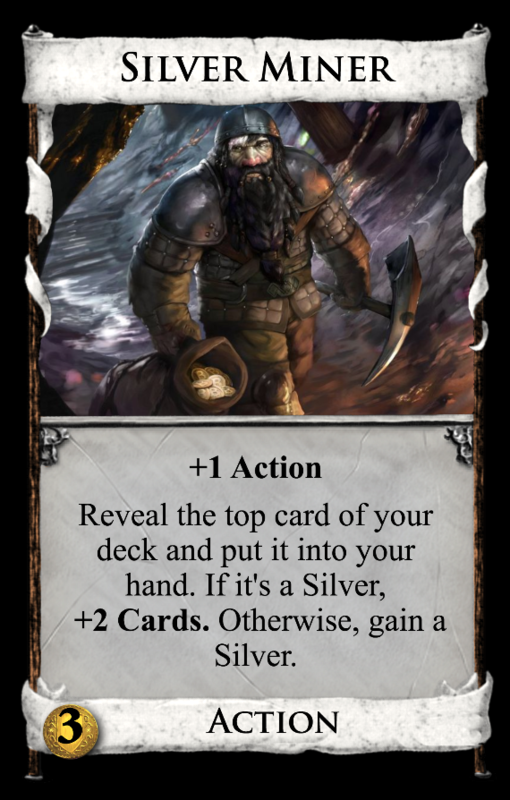 He could strike it rich off the top of your deck, or just find one in the Supply; he'll get you a Silver one way or another, he's no slacker. It started out as a wackier concept, but morphed into a Menagerie variant. I'm not totally happy with it, but I could revisit it some day. Reveal the top card of your deck and put it into your hand. 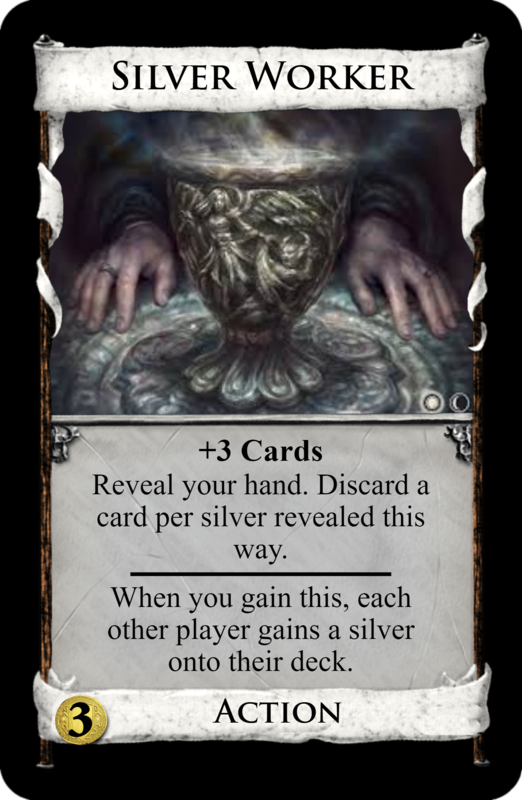 If it's a Silver, +2 Cards. Otherwise, gain a Silver.